NEW YORK -- A new video taken Sunday night has sparked a social media firestorm, with many saying a furry scavenger perfectly captures the life of an average New Yorker. 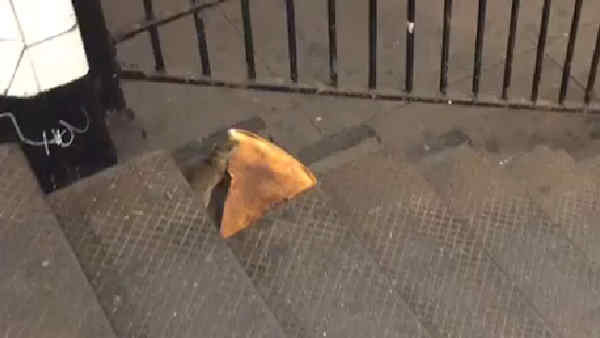 The video, taken by Matt Little at the First Avenue L train station in the East Village, shows a rat attempting to carry a slice of pizza in its mouth while climbing down the stairway. The rat eventually dropped the pizza and scurried away. Shortly after the video was posted, #PizzaRat shot up the trending charts, with many commentators bucking the usual trend of people being grossed out by the rodents. Wasn't trying to make a statement, humans. Just trying to get some damn pizza down some subway stairs.